Awaken the healing power within you and hone your intuition as a healer while being immersed in the pristine nature of Costa Rica. You will experience personalized training and hands‐on experience with our signature healing modalities, offered by Tranquility’s lead teachers Alisha Olivier Park, Alexandra Smith and Gianna Mauceri. This retreat includes training in healing arts courses, plus daily yoga and meditation, meals and exquisite lodging. Hone your intuition as a healer and explore the sacred art of living from the innate power of divine wisdom working within you. Register: $700 non-refundable deposit due at time of registration. Full payment due no later than September 1st. Payment plans available at no additional cost. Payment accepted via credit card. Cancellation Policy: If cancelled before September 1st your deposit can be applied to a future Tranquility retreat. Connect with us below to select accommodation and you will receive a quote via email. Also we are happy to set up a call to answer any questions you may have. Alisha Olivier Park, Spiritual Teacher & Mentor, was born in Berkeley, California and raised on the island of Oahu, Hawaii. Alisha uses the wisdom she has learned in her own inner journey as a catalyst to serve humanity. Her passion is guiding people through their journey of personal transformation– back to their True Self, fully inspired and on their way to living a life that they love. Alisha trained and worked alongside Dr. Deepak Chopra as a lead teacher and as Director of Seminars for the Chopra Center in Carlsbad, California. Following that work, she founded a wellness center, healing arts school and developed Yinki® Yoga. Alisha has dedicated the past 15 years to guiding others through the journey of Spiritual transformation. 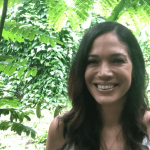 With the wisdom gained from her own journey, and as a mentor to hundreds of people, Alisha has developed a highly effective and personal transformation course, Healing from Within. This online course guides students to live a life they love by understanding and processing the pain of the past, transforming limiting beliefs and negative patterns, and learning Spiritual wisdom to live a fully conscious, joyful and fulfilling life. Alisha lives in the jungle of Costa Rica with her husband and two children. She travels the world to share wisdom and inspiration, and when at home, leads retreats in the stunning, untouched nature of Costa Rica. Design Your Retreat Experience – Choose your preferences below and we will email you a quote. I consent to Alisha Olivier Park collecting my details through this form.